Interaction is integral to the blogging experience. We’ve just redesigned sharing and reblogging on WordPress.com to make joining the conversation even easier. Today, we’re launching a refreshed sharing and reblogging experience. We’re bringing both visual and functional improvements to how reblogging, sharing, and liking posts on WordPress.com works. Let’s take a look at some of the changes we’ve introduced. We’ve redesigned reblogged posts for clearer attribution and more intelligent excerpting. If the reblogged post contains pictures, those images now really shine — even in the reblog. With a more subdued, streamlined feel, these buttons lend your posts’ footer an airier, lighter look. They now also share the same visual style as the Like and Reblog buttons. We replaced the previously-used graphics with an icon font — which means the new icons look great on any screen, regardless of resolution, even when you zoom in. In fact, if you have the Custom Design upgrade, it’s now easier than ever to customize these buttons further. Changing the color of an icon font is as simple as one line of CSS. To select this gorgeous, round version, pick the “Icon only” option from your dashboard, by going to Settings → Sharing. We really hope you enjoy these improvements! Improvements are much appreciated. What about the ability to save a reblog as a draft, in case you want to work it a bit? Can images and HTML be used in the reblog “thoughts” now? Interesting, but will Ratings/Ratings Widget get updated as well and/or integrated with Likes/Top Posts & Pages Widget because they have needed updating/improving and/or integration for a long time? Just reblogged a friend’s post and it’s not showing on my blog’s home page or being shared on my facebook either. Wondering about this. I CAN see it when I click through “All posts” on my Dashboard. Any insights?? 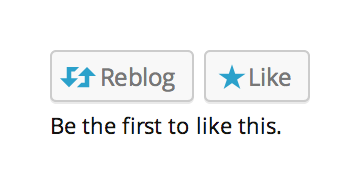 What about a like button for non wordpress users? Many of my readers not on wordpress have told me my like button doesn’t work! As they want to like the article but can’t. If I caught anyone reworking one of my essays, it wouldn’t be pleasant. I presume that would be against WordPress guidelines. Right? As for interaction on a blog, that’s what the comment section is for. When using the reblog buttons, users aren’t offered a copy of the post they’re reblogging to edit. They are only offered the ability to add their own optional thoughts. Great additions. Would love to see a Zemanta-like feature return too! @JoenA ~ That’s the way it should be. Thanks for the response. Love the round version. Just changed over to those on my blog. This sounds really good. I’ve never been that sure how reblogging works, or if it credits the original author of the post, so this seems like a great idea. Hi, what about the themes where round images are not a good match? For example, where the comment icons are in square, things just don’t match with round and square together on the same blog. The colors are much sharper than face book. If it is as easy to post, I have friends that have been looking for a different talk space than face book. 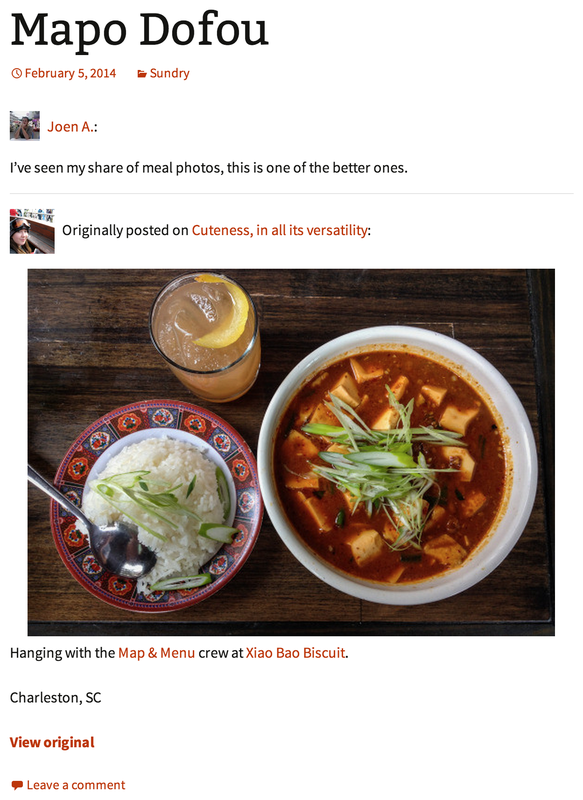 Pompous opinion: Reblogging should not be allowed on WP.com, and the new social buttons are not good. Instead of this nonsense, the ability to remove unwanted “for profit” followers that skew your actual follower number, and the ability to remove disingenuous “Likes” would actually be useful. I just tested all the available options. I am not finding any to my liking. The previous small/square icons were most appropriate for my blog. Now the big round ones are over empowering the font size, space and the style of the blog. I am now hoping that you would bring back the small sized square icons for those who may not prefer to have round icons. Please. I dig the options and its nice to see you letting us know too! Very nice! You know what might make it better? A way to reblog on a schedule, like “reblog at 4pm tomorrow”. Or a queue of some sort. That way as I go through my feed and find things I like, I could reblog several things at once, but not spam my own followers or have things get lost in the shuffle. Super beautiful update, thanks! Love the new, circular, Share button icons! I’d very much love the option to block “profit” followers too. And perhaps people who indiscriminately like ALL your posts. I’m not sure if it’s even people or some spambots. Maybe some food for thought for future? I feel obliged to add that even if I may not be happy with absolutely all about WordPress, I’m still extremely happy with the platform on the whole. Thank you for giving us the ability to decide whether to allow our content to be reblogged from our sites, even if one can still reblog from the Reader. It’s truly appreciated. To shoreacres and Joen A: I apologize for expressing my question so badly. I was not asking for the ability to edit the original post content being reblogged. What I meant was the ability to save, as a draft, the portion of the reblog that contains my introductory comments. I believe it used to work like that in the past. I agree the reblogger should never have the ability to edit the original post. Also, at least on my blog using the Greyzed theme, the reblog is visually glitchy. What about a pinterest icon button? There is a pinterest button, actually. You can add it in Settings > Sharing. new blog’s social sharing buttons: am I the only one who cannot read the numbers inside? Sorry about that, should be fixed if you refresh. I had an intuition that WordPress people must be working on the “Reblogging” option. And what a pleasant surprise! This is really good. Can I pre-select my category while re-blogging? Will I be able to select how many words / pictures I want to appear in my reblogged post? That’s a great development! Can we embed some portions of the reblogged post on a page? I do not like the new share format. I liked being able to see how many shares a post received and that function disappeared with the new look. There was a bug that prevented that from showing up. I fixed that just five minutes ago, sorry again. The share counts should be visible again upon a reload. Excellent and easy to update! I like the design, but I wish the like button were a little larger. With the colorful icon buttons, “like” kind of gets lost, especially since the font below it (that says how many people have liked the post) seems to have gotten smaller. Thanks for updates. Sorry for naive question, but can you quickly tell me what “reblogging” actually does? The icons are interfering with my last post layout and images. Not rendering very well at all. Thanks for the report, we’ll fix that. I managed to fix it by using line breaks in the end. That shouldn’t be necessary. I just pushed a fix. Sorry about that. You should give us the ability to remove the reblog button, because I don’t want it at comments. Hmmm. I would prefer to be able to turn off that reblog button. The new reblog button that’s shown next to the Like button can be hidden if you go to Settings > Sharing. Thanks so much for the ability to nix the ability to reblog posts. Now what we need is a high powered education campaign for those, who rely on reblogging as a substitute for publishing original content. It seems many need to learn how to actually blog properly by creating their own unique posts and posting only a brief (75 consecutive words or fewer) properly attributed quote backlinked to the original post, rather than using that reblog button at all. Thank you for this improvement! Pleased to have such an improvement. Thank you. I see we can turn off the new Reblog button next to the Like button, and it looks like it also turns off the Reblog button in my Admin bar. But does this prevent others from reblogging my material, or, as I suspect, is it just hiding the button from me? I’m very much opposed to the Reblog function and am not happy that you are making my images even better looking on someone else’s blog. People should have to come to my blog to see my material. So long as copy/paste exists, it’s impossible to prevent users from copying text. A reblog is not a republished post, it’s an excerpt with loads of attribution and links to the original post, including a signal to search engines not to count it as belonging to anyone but the original author. Awesome improvements 🙂 Looks great. I like the streamlined full buttons; they’ve got a nice muted look. Also like the icons only, but they are a little too colourful with the likes gravatars right underneath. Good stuff. In response to John with the “pompous opinion”… I certainly understand where you’re coming from. I, personally, will never ever ever reblog anything. I’ll cite a portion— not a lot, not all— and give credit. That’s about it ’cause I my blogs are my body of work and as authentic as possible. But some folks do like to reblog. I’m reminded of Newton’s theory on “equal and opposite reactions” as well as Khalil Gibran’s philosophy. The blogging world has lots of diversified thinking, eh? And so we learn to give and take… and aspire for a happy medium. Correction: That’s about it ’cause my blogs are my body of work, and I try to keep them as authentic as possible. But some folks do like to reblog. I find the new icons more obtrusive and visually disturbing. I now changed to Icon + text. But I want the old icons back! very aesthetic idea all we need to do it in spartan way. The grey option is a gift for those looking for a subtle option for their blogs. And congratulations on keeping us informed about any changes you apply. One more testament of the “ideology” of WordPress team! I preferred the visual style of the old social sharing buttons. But why do your custom buttons only display share counts for Twitter, Facebook and LinkedIn? What about the other services? Really like the new style of the buttons! I would love to use the Pinterest button too, but it is invisible in Settings > sharing on my desktop computer, it is visible on my tablet but there I can’t drag the button to Enabled Services. Can you help? I can’t reproduce your issue. Please try and force refresh the Settings > Sharing page (hold Shift, press the reload button). If that doesn’t fix your issue, please contact support. Love the cute little round icons! I also love how often you guys bring out these little reworks to continue to make wordpress better and better! Thanks, and keep up the good work! Sorry, but I’m NOT jumping for joy on this one. At my age, my hand once in awhile will shake – one false move on the Like button and I’m re-blogging someone’s post. Clicking the reblog button will invoke a dialog asking you to add your own thoughts to the shared excerpt, and then require you to confirm posting the reblog. Thank you for the improvement. I am ready to reblog some more. Just happened to drop by and immediately disabled the new reblog button manually on my 16 blogs. 😦 I suggest as a default setting new buttons or features should be turned off and anyone who wants them on they blog can then enable them. Question, please… Do we have the option of not having the “reblog” button on our posts? Or is this a one size fits all decision? Thanks. When a user reblogs a post on your blog, the reblog includes proper attribution and tells search engines to only index your source post. This gives your blog extra traffic and exposure. If you’d like to hide this button from your posts, you can do so in Settings > Sharing. Thanks, Joen. Yes. I’d read your explanation in one of the previous comments; but I just wanted to be sure I’d understood you correctly. Thanks so much! No, but you can copy one of your own posts if you like. I’m trying to reblog a post I wrote on another blog site on my private blog, but it isn’t working. Is there a delay? Will try again later today. Reblogs only work for WordPress.com blogs. If it’s a WordPress.com blog you’re reblogging from and it’s still not working, please contact support. Looks good – Thanks ! This should be an option, not something automatic. Not really fair to those of us who liked the old version. Besides, it is something on our websites. It is one thing to have an update for WordPress or editing, but something that appears on our site? No. That’s absolutely wrong. I am astonished to find out that after being disabled the reblog button still appears in the Reader. Why is that? Only those who are logged in could use the reblog button in the first place, so why are we being provided with this phony baloney disabling reblogging option that’s ineffectual? I don’t get it. Please explain. I started a Forum topic on re-blogging and feel very strongly that WordPress should make it an option, giving the author creative control. I suggest adding an “Allow Re-blog” box next to the “Allow Comments” and “Allow Pings” under the Quick Edit. We are aware of a couple of issues with some themes, including Chateau, and are working to fix those. Sorry about that. thanks Joen, well done sir! Question: When I reblog, the images on the reblog sometimes get saved into my Media list as well. Why is that? Is there any way that I can disable this? Can anyone confirm whether these design changes to the buttons will be added to the Jetpack sharing module?